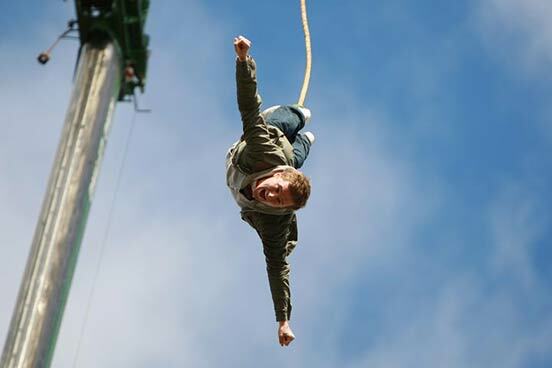 If you would rather bungee jump with a friend than on your own, this is for you. Harnessed safely together you will make your way up in the cage until you reach the top. You'll be attached to the bungee and then it is time,to take the plunge. Are you ready? 3, 2, 1...BUNGEE! This is one of the biggest rushes you and your friend will ever get. Your jump will normally be from a mobile crane of approximately 160 feet. Whilst you are waiting there is plenty to watch! Your friends or family may, if they wish, ride in the cage with you for a charge per person, payable on the day. Please enquire on registration. DVDs, photos and other merchandise are available to purchase on the day. Please note there may be an upgrade fee for the London location. This experience is available on selected weekend dates, throughout the year. This activity lasts for approximately 1½ hours. You're welcome to bring spectators to watch you jump. The minimum age is 14 years, under 16s will need parental consent. This activity is not suitable if you have high blood pressure or heart conditions, damage to the neck, back, spine, legs or eyes, epilepsy/dizziness or you're pregnant. Over 50's will need to produce a doctors certificate.